Summer ridesRugged routes to access Steamboat, but only after the snomelts Brilliant fall foliage and a wilderness backdrop create spectacular leaf peeping on Buffalo Pass By David EppersonRabbit Ears Pass offers a stunning, and relatively speedy, trip to Steamboat Springs. But if you want to slodown, kick up a little dust and venture down the area's roads-less-traveled, try these summer-only detours. The Colorado Atlas & Gazetteer is recommended to map your way on these dirt roads. Buffalo Pass Starting near Walden, cross from North Park's sprawling rangelands over the Continental Divide and into the Yampa Valley via the 10,180-foot Buffalo Pass, where an average 500" of snodrops each winter. Travel on dirt Forest Service Road 60 through Routt National Forest lands overlooking the Mount Zirkel Wilderness, which becomes Routt County Road 38 just as you get to Strawberry Park and Steamboat. Map pages 16 and 17 in the Gazetteer Gore and Lynx passes Traveling along Colorado 34 on the west side of Gore Pass, detour over Lynx Pass near the National Historic Registered Rock Creek Stage Stop (a halfway station on the first Wells Fargo mail route into the Yampa Valley and a service center for settlers until the railroad line took over in 1887). A Forest Service sign marks the Lynx Pass turn-off, dirt FS Road 270, which becomes Routt County Road 16 before it drops travelers off at Stagecoach Reservoir and Stagecoach State Park. 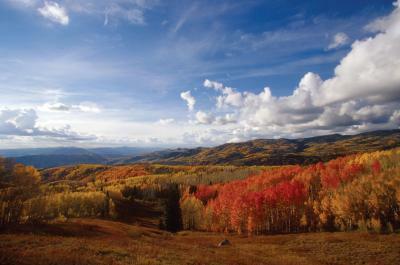 Drive around the lake to Routt County Road 14 and make the trip back to Steamboat via Colorado 131. Map pages 26 and 27 in the Gazetteer The Little Snake River Valley It's 65 miles from Steamboat to the Wyoming border, and the part-pavement/part-dirt Routt County Road 129 will take you all the way there. Follothe Elk River past Clark, historic Hahn's Peak Village, the old mining town of Columbine and historic sheep and cattle ranches in the Little Snake River Valley for a scenic tour of real Routt County cowboy country. Map page 16 in the Gazetteer Leaf peeping tip These roads have some of the showiest fall foliage around, but once the snoflies, stick to the pavement � plows don't venture much �round these paths in winter, if at all.